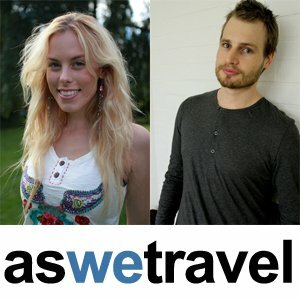 Today’s Travel Tuesday (#TT) Feature goes to Nathan and Sofia from AsWeTravel.com. Nathan and Sofia started AsWeTravel.com around the same time as I started RunawayJane.com, back in February 2010. They had been blogging for about 11 months before that, under the url names nathansofia.com (8 months), and nathansofiatravel.com (3 months), but after finally deciding on their As We Travel name, their site has stormed into the top ranks of the travel blogging industry, with an average Alexa rank of 53,000, and a place amongst the top travel bloggers in every reputable Top 100 list! Their quick succession into one of the top travel blogs around comes plain and simply from the useful and insightful content they produce. Some of my personal favourite posts of theirs include Why I Travel Instead Of Study, How To Travel With No Check In Luggage, and Things To Do In London – For Free! Sofia also wrote a guest post here on RunawayJane.com offering her tips on travelling as a couple, which is definitely worth a read. For more info about AsWeTravel.com, or Nathan and Sofia generally, you can visit their website, or find them on Twitter @AsWeTravel.